On Thursday one of the mother’s in Oliver’s waldorf group approached me and asked if I had chickens. Some days I think we are the only family in West County with a chicken-less backyard. I’m OK with that. I like chickens, they’re great, I like to roast them, bake them, fry them, have them on sandwiches, but running around my back yard/over-sized flagstone patio? No thanks, I’ll pass. She looked very relived to find I was chicken-less, and then asked if I would like some chickens. Not so much. She explained they had ten chickens (they’d over-bought assuming they’d loose some to predators – and they hadn’t), and the chickens had started laying eggs, by laying eggs, there were “50 this morning” and she had some eggs in the car, would I like some eggs? Thankfully the chickens are not going to new homes, just their eggs. So I came home with a carton of free-range, organic, vegetarian diet eggs (the carton said vegetarian diet, but her husband made her scratch it out because the chickens ate organic, free-range worms and bugs, they were bad vegetarians). 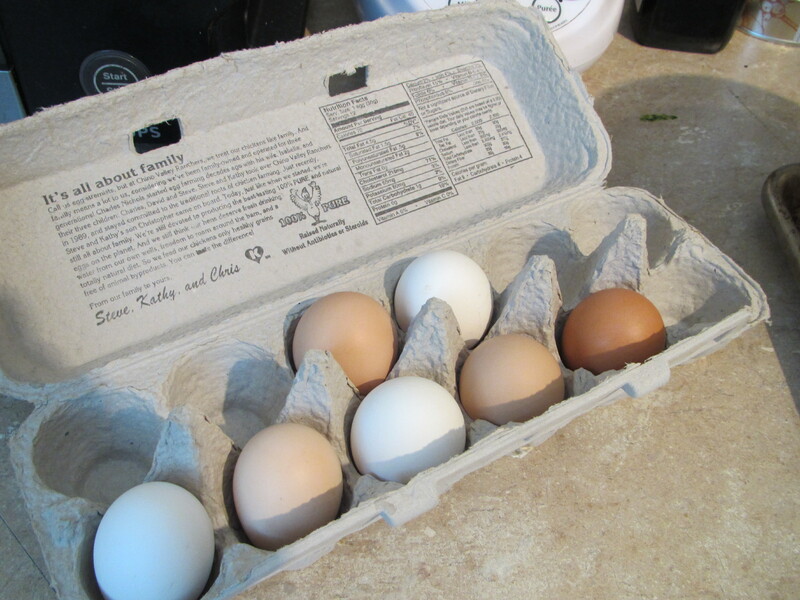 While I was thrilled by the gift of a dozen free-range, organic, vegetarian diet eggs, I usually buy them in cartons of six because I don’t use eggs very often. I didn’t want the eggs to bad (although Gavin has since assured me they’re likely to last for quite some time as they were freshly collected Wednesday and Thursday morning and grocery store eggs are at least a month or two old), so I did what any logical person with small children who like to “help” and who needs to use up a few eggs does: I decided to make custard-based ice cream. how did it turn out? sounds yummy. who is giving away layers? i may know someone who wants them. oh, and you’re hilarious, btw. it’s always a pleasure to read your “work”. Tirnen’s family has them, the chickens are NOT being re-homed, they’ve grown rather fond of all 10 of them.